The 9-hole Cedarbrook Gardens Golf in London, ON is a public golf course that opened in 1985. Cedarbrook Gardens Golf measures 818 yards from the longest tees. The course features 2 sets of tees for different skill levels. The greens are bent grass and the fairways are bluegrass. The 18-hole Thames Valley Golf Course - Classic 18 in London, ON is a public golf course that opened in 1924. Thames Valley Golf Course - Classic 18 measures 6175 yards from the longest tees and has a slope rating of 118 and a 69. The 12-hole Crumlin Creek Golf Club in London, ON is a public golf course that opened in 1985. Crumlin Creek Golf Club measures 3249 yards from the longest tees. The course features 3 sets of tees for different skill levels. East Park Golf Gardens is perfect for families since not only is there an 18-hole course for the adults, there are also numerous activities available for kids including mini golf, bumper cars, a water park, and rock climbing. The 18-hole Echo Valley Golf Course in London, ON is a semi-private golf course that opened in 1971. Echo Valley Golf Course measures 6343 yards from the longest tees and has a slope rating of 121 and a 70.1 USGA rating. The course features 3 sets of tees for different skill levels. The 18-hole Green Hills Golf Club in London, ON is a private golf course that opened in 1975. Green Hills Golf Club measures 6472 yards from the longest tees and has a slope rating of 133 and a 71.4 USGA rating. The course features 5 sets of tees for different skill levels. The 9-hole Thames Valley Golf Course - Hickory 9 in London, ON is a public golf course that opened in 1930. Thames Valley Golf Course - Hickory 9 measures 2220 yards from the longest tees. The course features 3 sets of tees for different skill levels. 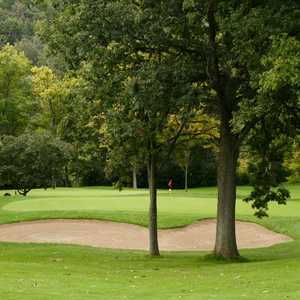 The 18-hole Hickory Ridge Golf & Country Club in London, ON is a semi-private golf course. Hickory Ridge Golf & Country Club measures 5172 yards from the longest tees. The course features 3 sets of tees for different skill levels. The 18-hole Highland Country Club in London, ON is a private golf course that opened in 1922. Designed by Stanley Thompson, Highland Country Club measures 6584 yards from the longest tees. The course features 6 sets of tees for different skill levels. Greens and fairways are bent grass. The 18-hole London Hunt & Country Club in London, ON is a private golf course that opened in 1960. Designed by Rees Jones and Robert Trent Jones, Sr. , London Hunt & Country Club measures 7249 yards from the longest tees and has a slope rating of 136 and a 75. Ongoing improvements over the past 40-plus years have helped contribute to Maple Ridge Golf Club's standing as one of London's best. The layout incorporates a variety of trees, strategically positioning them in just the right areas. 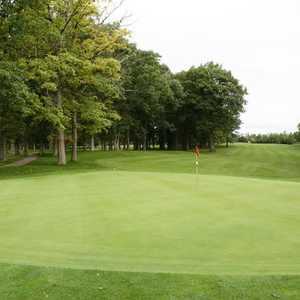 The 9-hole Fanshawe Golf Course - Parkside in London, ON is a public golf course. Fanshawe Golf Course - Parkside measures 900 yards from the longest tees. The 18-hole Fanshawe Golf Course - Quarry in London, ON is a public golf course. Fanshawe Golf Course - Quarry measures 6276 yards from the longest tees and has a slope rating of 117 and a 69.4 USGA rating. The course features 3 sets of tees for different skill levels. The 18-hole River Road Golf Course in London, ON is a public golf course that opened in 1992. River Road Golf Course measures 6450 yards from the longest tees and has a slope rating of 130 and a 71.6 USGA rating. The course features 3 sets of tees for different skill levels. The 18-hole RiverBend Golf Club in London, ON is a private golf course. Designed by Doug Carrick, RiverBend Golf Club measures 6914 yards from the longest tees and has a slope rating of 129 and a 73.1 USGA rating. The course features 6 sets of tees for different skill levels. The 18-hole Sunningdale Golf & Country Club - Robinson in London, ON is a private golf course. Designed by C. E. Robbie Robinson, Sunningdale Golf & Country Club - Robinson measures 7001 yards from the longest tees and has a slope rating of 125 and a 73. The 18-hole Sunningdale Golf & Country Club - Thompson in London, ON is a private golf course that opened in 1933. Designed by Stanley Thompson, Sunningdale Golf & Country Club - Thompson measures 6669 yards from the longest tees and has a slope rating of 124 and a 72 USGA rating. The 18-hole West Haven Golf & Country Club in Hyde Park, ON is a private golf course that opened in 1990. West Haven Golf & Country Club measures 6909 yards from the longest tees and has a slope rating of 129 and a 73. 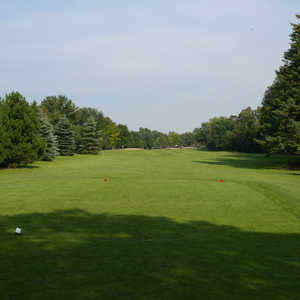 Westminster Trails Golf Club is one of the most popular public golf courses in London, Ontario. It is a link-style layout with wide fairways that are bordered by frustrating fescue. There are also lakes and ponds that come into play on a few holes.